Our Santa Monica car accident lawyers and law firm provide expert personal injury legal services for those injured in auto, motorcycle, bicycle, pedeatrian and other accidents, and for the relatives and families of those killed in car and other fatal accidents for wrongful death claims, in Santa Monica, California, a city located in Los Angeles County, California. 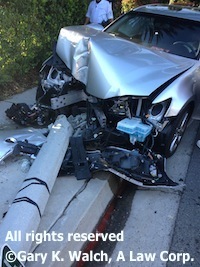 If you had a car accident or other personal injury claim in Santa Monica, Malibu, West Los Angeles or anywhere else in California, please contact our car accident injury attorneys and legal team now for a completely FREE CONSULTATION. For additional helpful information about car accident injury claims, please visit our updated and comprehensive Car Accident Web Site simply by clicking here. The spectacular beachfront city of Santa Monica is bordered by Pacific Palisades and Malibu on the northwest, Brentwood on the north, West Los Angeles on the northeast, Mar Vista on the east, Venice on the southeast and, of course, by the Pacific Ocean to its west. 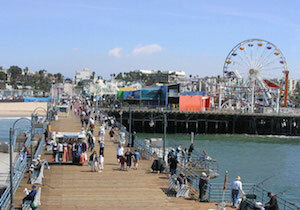 Santa Monica is known to be home to many Hollywood celebrities, surfers, professionals and students. According to the 2010 United States Census, the population for Santa Monica is 89,736. A Santa Monica car accident should not be taken lightly as it has frequently shown to be extremely traumatizing for the victims involved so it is vital to have an experienced car accident lawyer on your side. Our firm’s 40 years of success in handling car accident and other personal injury cases in Santa Monica and throughout California has given us the recognition of PERSONAL INJURY LAW FIRM OF YEAR 2011. The aggressive and compassionate demeanor of our attorneys and staff has made it possible for us to resolve many thousands of cases. We work extremely hard to make the claims process easy for our clients, the victims and their families. Two of our senior car accident attorneys, Robert Walch and Gary Walch, were each selected as Top Lawyers in California (Highest in Ethical Standards & Professional Excellence). Our staff encourages you to visit our new and updated Car Accident Web Site. The Walch Law Corporation has successfully recovered over $100,000,000.00 in funds for its clients and offers instantaneous assistance with medical care (usually without any payment until the case is resolved), specialists, property damage repair and settlement. We also invite you to read our Car Accident Testimonial Pages simply by clicking here. TMJ or facial jaw joint injuries are just some of the serious injuries that victims of car accidents experience. TMJ is short for "temporomandibular joint". The temporomandibular joint connects the lower jaw, called the mandible, to the temporal bone at the side of the head. The temporomandibular is the most frequently used and complex joints in your body. The TMJ is injured by direct impact, such as when an airbag deploys and strikes the victims face, or the thrust of a “whiplash” type injury, including when the victims head hits the seat rest. Symptoms that point to a serious TMJ injury include a clicking sound when opening or closing your mouth, locking of your jaw, difficulty or discomfort while chewing or biting, pain in neck, shoulders and back, hearing problems and dizziness. If you or someone you care about sustained any TMJ and Jaw Joint Injury from any car accident or other personal injury accident in Santa Monica, Malibu Los Angeles or anywhere in California, please contact us now, including for referrals to doctors who may provide treatment without expecting any payment until the claim is resolved. The Law Offices of Gary K. Walch gives you the strong support and advocacy that you require when you, a loved one or someone you know has been a victim of a devastating car accident or other personal injury accident in Santa Monica, West L.A., Malibu or throughout California. It is our goal to best represent your interests and aggressively pursue your rights. Our staff handles accidents involving car, motorcycle, truck, bus, train, bicycle, pedestrian, hit and run, uninsured motorist (UM) and much more. Call us for an entirely FREE consultation to assess and examine your car accident or other personal injury case. For your convenience you don’t even need to leave the comfort of your own home. Just like many of our clients you can do everything by telephone at 818-222-3400 or toll free 866 INJURY 2 (465879 2), email (info@WalchLaw.com) or simply complete our very easy to use contact form.